This project is going to be an on-going job, which we are going to do in stages. This is as requested by our client and will also allow us to fit it in with our busy work scedule. The next stage is to prepare and lay the framework for the decking with pergola. 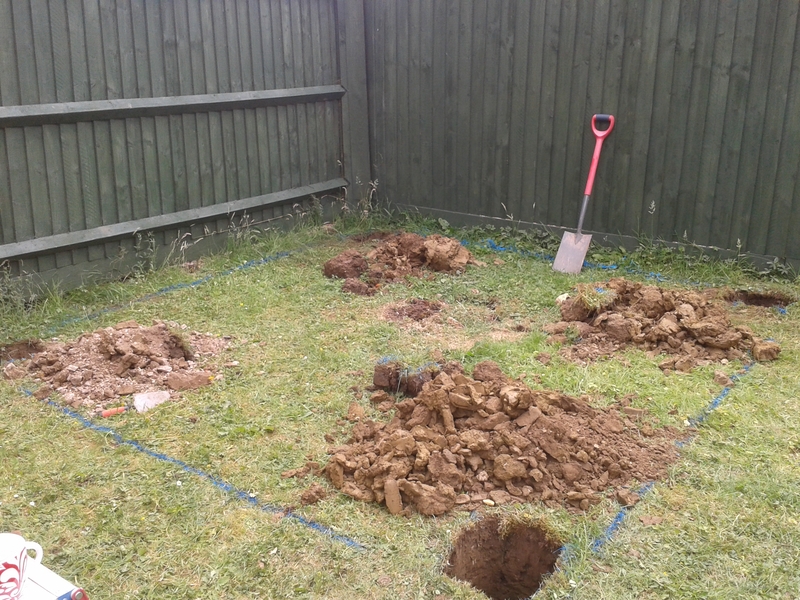 The holes were dug in preparation for the posts for the pergola, the decking frame will also be anchored to these posts, so we need to ensure they are deep enough to take enough mortar to support the structure. The basic frame for the 3m x 3m decking is constructed independantly before being lifted into place. Great care is taken as we fix the posts into position, ensuring that they are level and square so the decking frame can be fixed to them once set. The frame is now fixed to the upright posts, extra legs have been fixed in place to ensure the entire structure is stable and will remain level; these also give extra strength to the decking. We are now ready to complete the decking, we are laying the deck boards at the same angle as the ones laid on the decks at the house end of the garden, this will ensure uniformity. All the decking has now been laid. All are the correct shape and sizes, all are in the correct positions and all the boards are running true and in the right direction. The last job to complete this stage is to finish the construction of the pergola. As you can see we made it... with the pergola completed, the first stage of the project is completed to satisfaction. We are pleased to report that we are both on schedule and within budget.